The true fascinating moment of the sun rising from its sleep is such a natural-exotic panorama that would become your most unforgettable story in your life! The beautiful line of horizon with golden color is a moment of the morning that is not only amazing, but also able to spread positive energy for every landscape lover. That is why, the charm of sunrise has always been awaited moment, even it is sought by many people when visiting a city. For those of you who are in the city of Magelang, it would not be perfect if you do not see the mesmerizing moment of sunrise in this city. There are some best spots to enjoy the splendid sunrise moment in Magelang while relishing the magnificent of Borobudur temple. Here’s the information for you. The temple is located in Borobudur district, Magelang Regency. This temple is indeed famous for its beautiful relief and architecture that have been known worldwide. Its splendor has been enjoyed by travelers from all over the world. However, do you know that the marvelous of Borobudur is also capable of displaying the side of silence and full of magic? 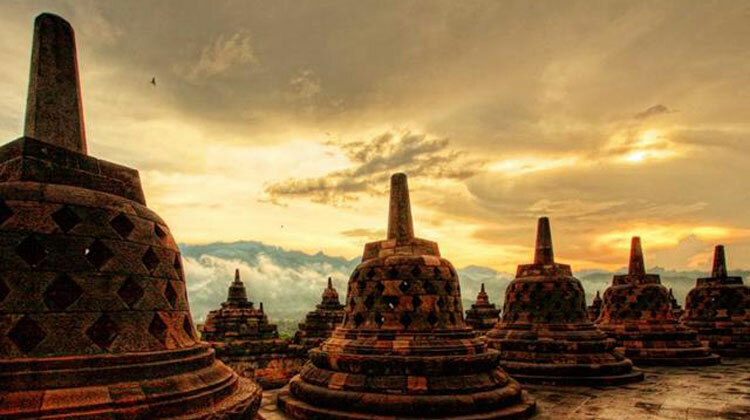 Enjoying the charm of Borobudur in the morning is a priceless opportunity. The gradation of the sky colors in the morning combined with the splendor of the temple, and supported by the magic of Mount Merapi and Mount Merbabu, become the most exotic sunrise in the world. It is something that is not to be missed! Borobudur Temple is open to the public starting at 06.00 am – 5:00 pm. While in order to enjoy the sunrise, at least you must be ready at 05.00 a.m. Then, how to be able to enjoy the Borobudur sunrise? You must first contact the party or officer of the temple. Usually, you have to pay a ticket of IDR 30,000 for a domestic tourist and IDR 250,000 for a foreign tourist or you can join the package tour of Borobudur Sunrise by contacting Hotel Manohara located in Borobudur temple complex. 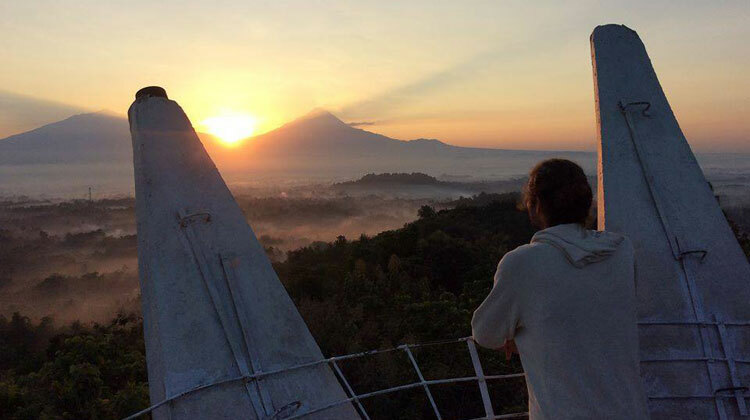 Another interesting spot to enjoy the beautiful sunrise in Magelang city is Punthuk Setumbu. Punthuk Setumbu is a hill located in Karangrejo Village, Borobudur District or about 5 km to the west of Borobudur Temple. 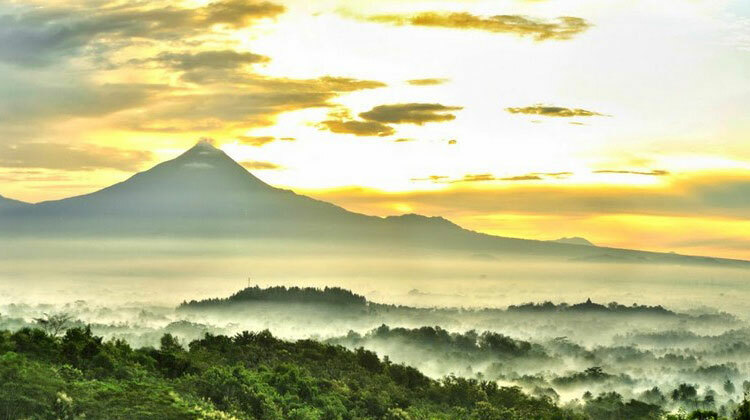 In this place, not only the exoticism of the sun rising from behind Mount Merapi and Merbabu will create unforgettable moment, but also the alluring temple of Samaratungga’s relic covered with fog in the morning. But, you shall prepare yourself because there are some challenges to reach this place. In order to enjoy the sunrise on the hill with the height of about 400 mdpl, you must first pay the retribution rate of IDR 15,000. Then, you have to climb the hill about 10-15 minutes. Since it is still dark, it is recommended that you bring a flashlight or other lighting device. If visiting this place during the rainy season, you should be more careful considering there are several paths with fairly sharp slope. When you reach the top, you can rest for a moment at the rumahpanggung, gazebo, or chairs provided, while waiting for the morning sun emerges from its hiding. You can also see the elegance of the sun rising up to illuminate the universe from the sidelines of the crown of the Chicken Church. Chicken Church itself is a house of worship in Bukit Rhema with a unique and distinctive architectural style. This building has several parts, namely the base level (chicken body), second level (chicken neck), third level (chicken beak), and fourth level (top) is the chicken crown. So, to be able to enjoy the mesmerizing sunrise in this place, you must first climb to the top of the building or crown of the chicken. 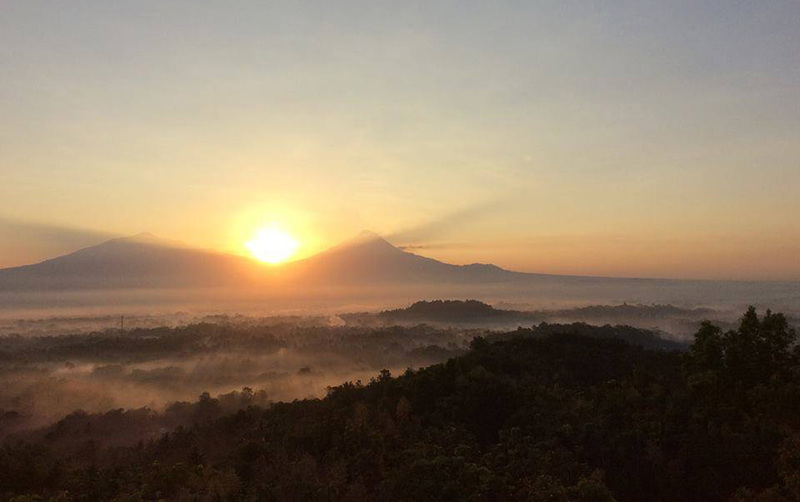 Then can you enjoy the amazing moment of the sun emerging behind the Mount Merapi and Mount Merbabu. The splendor of Borobudur Temple that seems to hang over the clouds also can be enjoyed from this place. In addition to Borobudur Temple, Punthuk Setumbu, and Chicken Church, you should also enjoy the best sunrise moment from Purwosari Hill. The hill is located in Wonotigo Hamlet, Kembanglimus Village, Borobudur District. 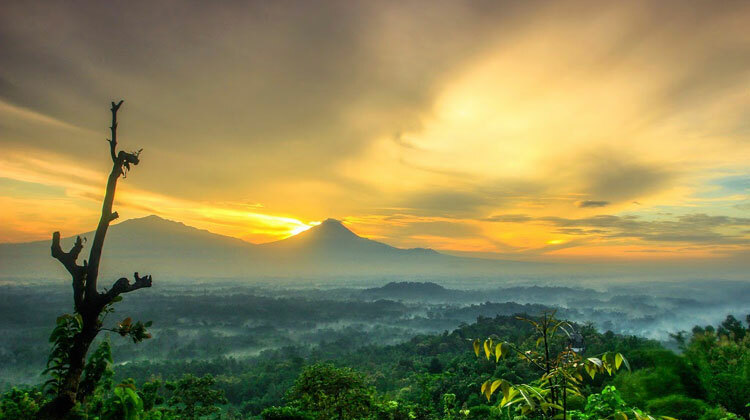 You not only can see the exotic sunrise from the top of the hill, but also, you can also witness the magnificent Borobudur temple covered with fog in the morning and the charm of the unique and phenomenal Chicken Church. Telomoyo is a mountain located on the border of Magelang and Semarang regencies. This mountain is in the range of Mount Merbabu, precisely located on the west side of that mountain. In order to enjoy the beautiful sunrise from the top of the mountain, of course you must be worried about how difficult and struggle to reach the spot. But, it is not for this mountain. You will not be burdened with all the supplies and climbing things because here you can travel by using a motor vehicle to the top. 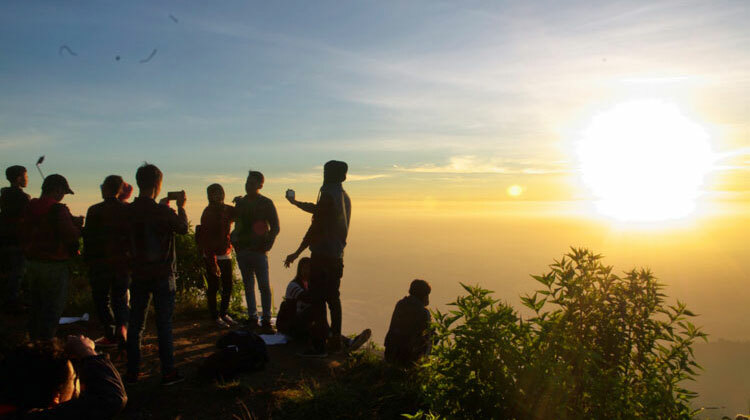 In addition to watching the beautiful sunrise from the top of the mountain, you will also be treated with a natural panorama of RawaPeninglake that is also dazzling and fascinating. So what are you waiting for? Let’’s enjoy the exotic sunrise at these best places.